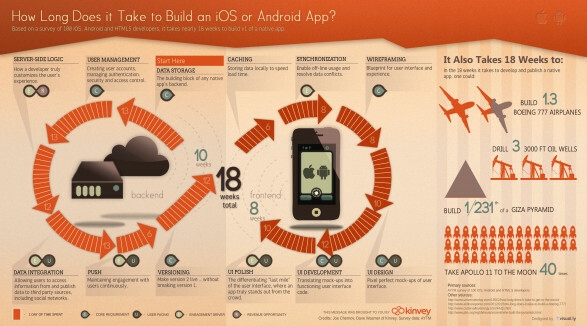 According to the infographic below, published on Visual.ly by Kinvey it takes 18 weeks to build an iOS or Android app; the same time, apparently, as it takes to build 1.3 Boeing 777 aeroplanes; quite what you can usefully do with 0.3 of a plane I don’t know. As a comparison this is particularly uninformative, as it takes no account of the research, design, development & testing required before a 777 reaches the production stage. Also, the 18 week period gives no indication of the amount of manpower utilised. 18 weeks of a single developer’s time is not the same as 18 weeks of a team of five working on different parts of the project in parallel. Which brings me to my main quarrel with this infographic: it treats design and user experience as something to be bolted on at the end of the process. How Long Does it Take to Build an App? infographic by Angelina for Kinvey. I’d hoped that design as afterthought was something we’d left behind; after all, in all the reams of material written about the success of Apple in the last ten years, the one thing which should be obvious is the importance of design, and its centrality to everything they do. Yet, here we have a diagram proposing that design is something you can successfully do at the end when all other decisions about the app have been made, developed and set in stone. I fundamentally disagree with the diagram’s linear development process, where activities happen separately and consecutively. That is the road to poor user experiences, unhappy users and unloved, unsuccessful apps. Design and development should work together, with each informing the other throughout the entire process; I include user experience as part of the design process – design is not just about making things look appealing. In order to create a successful app, you need to create a good user experience, and to do this you should be thinking the user experience and interface early in the development process. Thinking about how your users will interact with your app and accomplish tasks will, and should, inform the development. Likewise, development informs design by demonstrating what is (and isn’t) technically achievable; which may lead to you changing your design and user experience. When design and development work together, it results in better experiences than either discipline will create working separately. As a designer and a developer, I have a foot in both these camps. As well as projects where I have had just one of those roles, I’ve worked on many projects where I was the only designer and the only developer. So I’m used to viewing these disciplines not as separate activities, but as things that work together in parallel with one informing the other in a virtuous loop. Most designers and developers work only in their discipline, but all the good ones appreciate the skills and experience of their counterparts in the other camp. Design and development need each other to create compelling, successful user experiences and apps. They should be working together, in unison, not apart, in isolation.